Bonafide Kiwi legend Dave Dobbyn, who recently celebrated 40 years as a songwriter, recording artist and performer, will head to Australia with his band in November. Dobbyn’s extraordinary musical career began with high school band Th’ Dudes. His first try at writing a song was a ‘disaster’ and never saw the light of day, but he took the next attempt to the band and ‘Be Mine Tonight’ went on to be Th’ Dudes first release and winner of Single of the Year at the National Music Awards in 1979.
featuring songs released by Th’ Dudes, DD Smash and as a solo artist. He’s won Best Male Vocalist a record six times and the most awards of any New Zealand musician - three Silver Scroll awards and 29 New Zealand Music Awards across his career. The music hasn’t stopped coming - he released a 10th studio album as a solo artist, ‘Harmony House’, in 2016 and ‘A Slice of Heaven – 40 Years of Hits’ last year. Dave Dobbyn Releases Te Reo Version of Welcome Home - "Nau Mai Rā"
Dave Dobbyn’s ‘Welcome Home’, one of New Zealand's most loved songs, will be re- released in te reo on September 8th, to coincide with Māori Language Week. Often described as ‘the unofficial anthem’, the song has been translated by Te Haumihiata Mason as ‘Nau Mai Rā’. This new version was recorded with backing vocals from Maimoa, who’s Maori TV show ‘Voices Of Our Future’ sets out through music to re-engage youth in the Māori language. Dobbyn had no hesitation in embracing the collaboration. “Once I read Te Haumihiata Mason’s te reo translation, and her re-translation back into English, I was moved by the result. It’s such an honour to sing in te reo, a naturally poetic tongue. Listen to Nai Mai Rā HERE. Slice Of Heaven: 40 Years Of Hits Tour + CD! Dobbyn’s extraordinary musical career began with high school band Th’ Dudes. His first try at writing a song was a ‘disaster’ and never saw the light of day, but he took the next attempt to the band. That song – ‘Be Mine Tonight’ – went on to be Th’ Dudes first release and winner of Single of the Year at the National Music Awards in 1979.
featuring songs released by Th’ Dudes, DD Smash and as a solo artist. He’s won Best Male Vocalist a record six times and the most awards of any New Zealand musician – three Silver Scroll awards and 29 New Zealand Music Awards across his career. The music hasn’t stopped coming – he released a 10th studio album as a solo artist, Harmony House, just last year. All these songs and many more will feature in a theatre tour with Dobbyn and his full band, along with anecdotes about how the songs came to be written, told in his inimitable style. The tour is a classic rock n roll roadtrip down the country, kicking off in Whangarei on 12 April and wrapping up just over two weeks later in Invercargill. The tour coincides with the release of the Slice Of Heaven – 40 Years of Hits album to be released by Sony on 7 April. 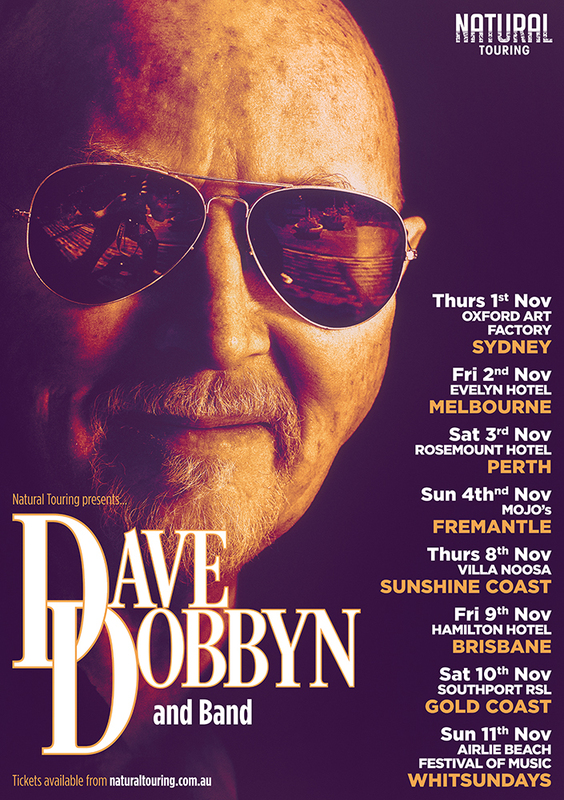 Dave Dobbyn Announces Return to UK & Australia! Hot off the back of a sold-out run of 16-shows in small town New Zealand, Dave & his band have just announced dates in both Australia & the UK. Record Store Day + shows! "It’s nearly eight years since the last new album from Dave Dobbyn, though somehow it doesn’t seem that long. When your songs have become such a part of the landscape then you are a constant presence, whether you are releasing new music or not. Still a fresh set of Dobbyn songs is welcome, and a chance to find out how that landscape is looking through the eyes of a master songwriter." You can listen to Nick Bolinger's full review of Harmony House here. Dave Dobbyn Releases "Angelina" Single & Video! It's called "Angelina", and we think it's pretty special. Taken from Dave's new album Harmony House, the record was produced by Samuel Flynn Scott & Luke Buda (The Phoenix Foundation). Please click the link above to watch! New Video for "Tell The World"! New DD Single 'Tell The World'! Dave Dobbyn is animated but relaxed as he talks about what he does best - write songs. It's mid morning and he's at his Grey Lynn home studio in Auckland with Samuel Flynn Scott and Luke Buda of the Phoenix Foundation. They're into the second day of working on material for Dobbyn's first solo album since 2008. Read the article by Mike Alexander here. ‘This Love’ by Dave Dobbyn with the Orpheus Choir of Wellington is a moving tribute to the Pike River 29. The piece was first performed at a concert attended by members of the miners’ bereaved families and was recorded by Radio NZ Concert. The choral arrangement is by Mark Dorrell. Also performing are Wellington Young Voices, Mark Vanilau (piano), Jo Barus (bass), Ross Burge (drums) and Chris Clark (cornet). All rights reserved, DobWorld Ltd. 2018.